We always told that Honda is trying real hard to squeeze its 160cc motorcycle platform to new heights. After launching Hornet and Unicorn 160 it is time Honda started working on a different type of motorcycle which is based on the same platform. 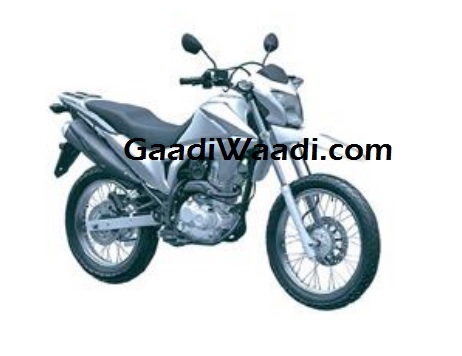 Honda has just patented Hero Impulse rival seen in the picture above. Honda wants to increase its market share in this category as it lacks the same because Bajaj and now Hero also is slowing gaining momentum with Xtreme and Hunk. As the image depicts it will get the tank and the extension of it from the Honda Unicorn 160. The headlamp cluster comes from the CB Hornet 160. The mudguard is mounted on the top below the head lamp cluster to depicts its true nature. Semi-off road tyres are also visible in these pictures. Braking will be done with the help of disc brakes which are present at the front and this time at the rear as well. Top mounted exhaust along with luggage carrier is visible too. Mechanically, Honda Off Roader 160 will be powered by the same 160cc engine which makes heaps of torque and horsepower. Honda will tune the gearing accordingly and there will be change in the fueling system as well considering the fact the same was done for the Hero Impulse in the past. Chassis wise, monoshock, single downtube chassis is a regular affair and is seen on this bike too. Launch should happen in the next four months as this could be one of the models that could be coming because Honda has said they will be launching four products before 2016. There was a gap in this segment and Honda is filling up, which is a good thing for enthusiast. However, 150 Impulse was not taken well because it lacked outright performance and this could change that as well.